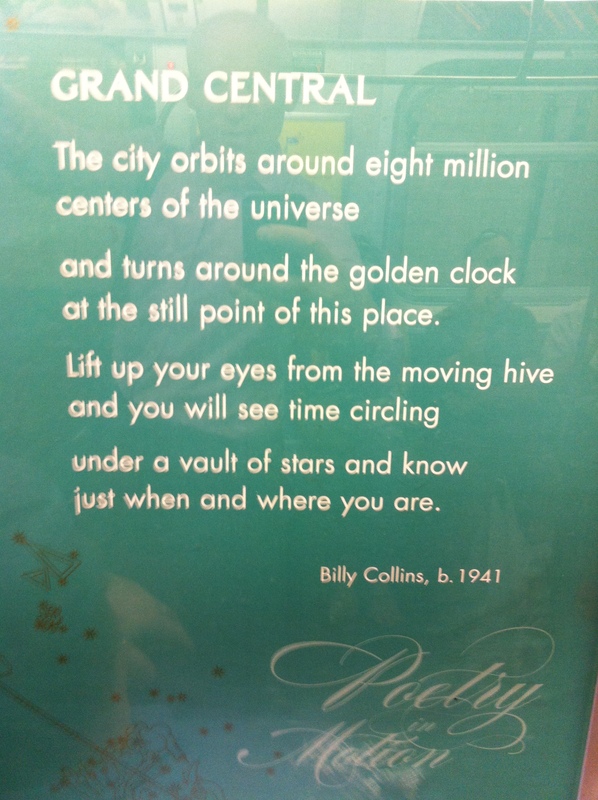 I spotted this beautiful Billy Collins poem on the subway yesterday, likely part of the commemoration of Grand Central Station’s 100th anniversary. Commuting on the train every day has its ups and downs. I vastly prefer it to spending a similar amount of time in a car, but it’s still a long haul from door to door. One of my daily joys, though, is getting to come through Grand Central Station. It is a New York City landmark breathtaking in its scope and beauty and yet bustling every day as one of the world’s biggest transit hubs. The $196 million restoration from 1991 to 1998 restored Grand Central to its former glory, removing 80 years of accumulated grime and restoring Grand Central to its former glory. The station has more than 100 secrets, a whispering galley, and a secret platform build for FDR with an entrance directly to the Waldorf Astoria hotel. But mostly just love that I get to go through there every day, I love the morning moments when I remember to look up and see the light passing through the East Side windows just so, I love the bustle on a Friday afternoon when you can barely walk two feet because of the bustle and energy as people line up to get away for the weekend. It reminds me of what great urban spaces can be.